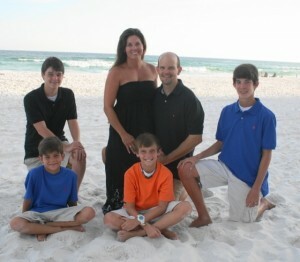 When Carolyn joined the Awaken Wellness program her original goal was to lose 15 pounds. She began a steady weight loss, then plateaued for about 2 months. We discussed cutting back her consumption of beef and pork. 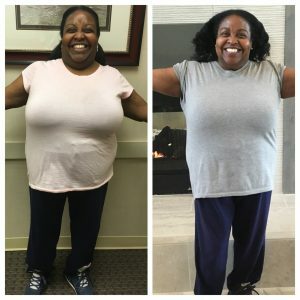 The next month she lost 4 pounds and within six months she exceeded her original goal to a total weight loss of 23 pounds. 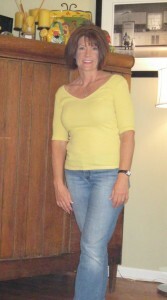 Carolyn lost 3 inches around her waist, 2 inches around her hips and lowered her BMI by 4 units. 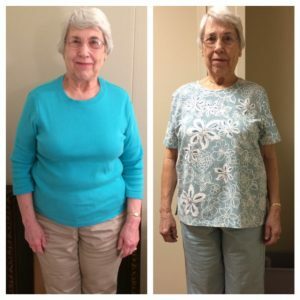 She indicates that after attending the program she has more energy, her arthritic knees don’t bother her anymore and didn’t know that losing weight could be so easy. Carolyn says she feels fully confident she will be able to maintain her current weight. Two hundred and five pounds! Let me jump on that scale again. Two hundred and five pounds, in my birthday suit!! That’s a BMI of 44.4. Ok, calm down.. I know, I’ll grab a snickers bar while I figure this one out. Jiminy Cricket or should I say Jimmy Johns. It was just one slice of cheese cake. How do I diet and still gain weight? I can’t continue to drag this weight. I’m going to have to take my husbands advice and see a nutritionist. My health is in jeopardy. What internal thought process says “It’s okay to indulge in a 16 count box of Ferrero Rocher Hazelnut Chocolates. Why was I a Chocoholic? While attending the Awaken Wellness sessions I have learned new habits, new coping skills and reflected inward to find out what makes me do the things I do. I was introduced to an old, familiar friend of mine as I slowly, strategically changed my eating habits and daily living activities. I walked past a mirror in my house and suddenly brought to tears by who I saw. She was a beautiful woman. She was the me, I use to know. I recognized ME! Me found Me. What a monumental moment. My life since then has changed. I like who I see in the mirror and I’m not losing me again to the stressors and challenges that life brings. Now, I know what to do and I’m never going back. One hundred and sixty-one pounds, a BMI of 34.8 and I feel great! I am more flexible, I do not fatigue as easily as I use to. I have dropped from a size 20 jeans to a roomy size 14 jeans and life is wonderful because I, who am so efficient at taking care of everyone and everything else, am now taking care of me. Taking care of me includes starting the day with God, eating “right”, exercising, meditating and enjoying life regardless of what comes my way. My goal is to reach a BMI of 27-29. I know with confidence I will be successful because I am on the right path making conscious, well informed, healthy choices . When my family moved to BridgeMill eight years ago, I had just given birth to our last child. With four sons (including a set of twins) born in under six years, I must admit that a formal exercise program was not exactly on my list of priorities. I was simply in survival mode! The extent of my cardio was using the staircase and pushing a stroller. My version of strength training was carrying an infant seat or lifting multiple bags of groceries and laundry baskets. I eventually began attending some of the classes at our health club and occasionally went through the motions in the weight room. But I lacked motivation and was not truly doing it for myself. Then about three years ago, I experienced a series of health problems that put me out of commission for awhile. It became necessary to undergo bladder surgery and a partial hysterectomy. I had to take it easy in order to heal properly. There were other issues creeping in too… frequent headaches, muscle aches and joint pain. I underwent scans and evaluations for persistent pain in my lower right abdomen. The diagnosis changed frequently – from diverticulitis – to an ulcer in my colon – to a benign mass which was surgically removed. By the time the whole process was complete, I was so tired of being “sick.” And worse yet, I was suffering from depression. All while trying to function as a busy mother and a supportive wife. Fast forward to January of 2011, when thankfully my personal story becomes brighter. I had already taken some important steps to help combat my depression, but I also knew it was time to get back into shape. My goal? To be a healthier and happier person with more energy and less anxiety. I needed to lose weight and regain my physical strength, and it wasn’t happening by my own willpower. That’s when my journey with Andrea Mathis began. I met with Andrea twice a week on an individual basis for the first few months. • At first I was embarrassed by my lack of stamina; she was reassuring. • I felt weak and inferior at times; she built my confidence. • On days my joint pain flared, she administered Thai massage or reflexology to help the pain subside. There’s one thing about Andrea; she can push you to the limit, but she knows when to take the conservative approach too. And that is one reason I appreciate her so much. She treats her clients with respect and care. I continue to meet with Andrea once a week for personal instruction and also attend her Express workout class. Today I am 12 lbs lighter, have gained muscle tone & definition, and my endurance is improving. Do I feel better? Absolutely! Do my friends and family notice? Yes, they do! Initially Andrea was my choice for a personal trainer and fitness expert. But do you know what else I have received by working with her? I have found an accountability partner, a cheerleader, a counselor, a tough challenger, and a new friend. Thank you Andrea for all your help and encouragement to bring me this far. The transformation process is definitely working – inside and out. I wanted to take the time to let you know how thrilled I am with the success I have seen from the Lighten Up Weight Loss Program that is about to be complete this weekend. When we first met as a group, I was in a place of frustration with my level of fitness and overall progress with my weight. It seemed I had been trying to lose the same 10 lbs for years. After meeting with this amazing group of women on the very first night, I automatically started to feel better. I have come to realize that the ultimate goal in any wellness program is to feel better…to feel great. The reason anyone starts a weight loss program is that they believe it will make them feel better. Well, that is what we have all learned through these last 6 weeks. Through the physical training sessions with Andrea, the educational programs on the Law of Attraction, the focused homework and workshops and the incredible support from the group, I have never been happier in my life. I sleep less. I eat less. I complain less and my life is filled with joy. I’ve even made two new amazing friends through this program. 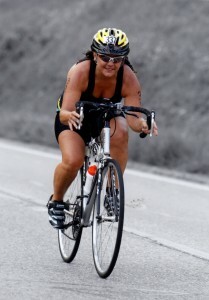 I have so much more energy and was able to compete and finish 2nd overall in the BridgeMill triathlon. My total weight loss was 8 lbs…but the gains for me have been immeasurable. Everyone I see asks me what I have been doing and why I seem so great. When I tell them about the program, they always say “I want to do that!”. I really want to thank you for allowing this program to happen. It’s so important. After a life long struggle with weight, I can finally say I will not be fat again. FAT? I earned the title. After delivering my second child at age 37, I was an impressive 235 pounds at 5’6”. Five weeks after coming home, at 224 pounds, I started attending Weight Watchers meetings. The amount of weight to lose was overwhelming, but slowly, 85 pounds came off. Three and a half years later, 25 of those sneaky pounds had found me again. I had continued to exercise during the gradual weight gain, but without dedication. Paying attention to my diet was half hearted. My supportive and fitness-minded husband cautiously gave me a gift certificate to see Andrea. Initially, the opportunity to see a professional trainer seemed to be a great idea. It took me one and a half years to finally set the appointment. Now she may never get rid of me. Andrea is not just a professional trainer. She is a life coach, a sounding board, a cheerleader, and a friend. She is tough, but understanding and accommodating. She will put you through tough paces, and you will thank her for it. She will listen when you cry and encourage you when you want to give up. Andrea Mathis has put me back on track. I see Andrea twice a week and have since March of 2011. The strength and endurance I have gained since beginning working with her is evident in each and every workout. She has taught me about more than diet and exercise. She has also taught me about living deliberately and positively so that I may obtain true happiness. She is teaching me to ‘let go’ and influence the outcomes in my life through positive attraction. At age 43, I feel better than ever. According to my husband, I look better than ever, too. I am down twelve pounds and plan to drop another 15. Living a healthy, fit, and positive lifestyle is certainly obtainable with the right support, and Andrea is a great part of my team. I look forward to continuing to grow with her as well as improving my fitness level. READY TO BE OUR NEXT TRANSFORMATION?